Celebrating the kitties’ birthday got me to thinking about how I have no idea when the froggies’ birthdays are. I don’t know if they all share the same birthday or if they have different birthdays. And, come to think of it, I don’t even know if you are supposed to celebrate the day the frog eggs were laid as their birthday or the day that the eggs hatched or even possibly the day the tadpoles metamorphosed into frogs. They just don’t tell you such things when you adopt frogs! So, I have made an executive decision to celebrate the frogs’ birthday on February 19, which was the birthday of Nicolaus Copernicus, the great mathematician and astronomer after whom Copernicus the Third, and his forefathers Copernicus and Copernicus the Second, were named after. 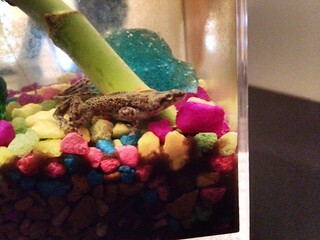 Also, I’m just realizing that I haven’t yet blogged about the recent frog tragedy at Chez Neige. A few weeks back at frog feeding time, only 3 frogs came out to eat. And, as we all know from the back of my car, I have 4 frogs. Now, the frogs are *very* good at hiding, so it was possible that perhaps one of the little guys was just having a snooze in the castle. Unfortunately, the fourth frog never materialized and so after a few days of only seeing 3 frogs, I ended up taking stuff out of the tank to make sure (s)he wasn’t hiding the castle or in one of the plants. And then I had to admit that the frog was MIA. I’m guessing that somehow, despite the lid being on the tank, the frog made a great escape (the lid doesn’t cover the entire area, as there’s some room between the lid and the filter cube in the tank, so it’s possible (s)he jumped out). Aquatic dwarf frogs can’t live more than 20 minutes out of water, so once a frog leaves the tank, that’s pretty much it for them. And there’s really two possibilities as to what happen to the froggy cadaver. Either I will find their dried husk under a piece of furniture at some later date or a kitty got a snack. If it was the latter, I wouldn’t blame whichever kitty it was – they are obligate carnivores, after all, and I don’t even know what would be a worse – slowly dehydrating to death or being devoured by a cat. I hope whichever way my froggy went, it was the less bad way. Also, I have a bit of a conundrum as all the frogs had grown to be the same size, so I was no longer able to tell them apart. So I don’t even know which frog is missing and presumed deceased! So now I’m going to make another executive decision1 – RIP Raspberry. You are missed. 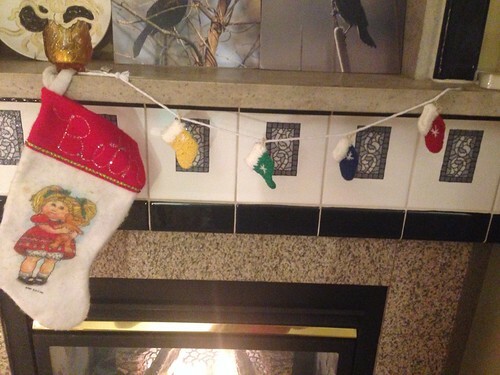 Merry Christmas from all of us at Chez Beth – feline, amphibian, and homo sapiens! 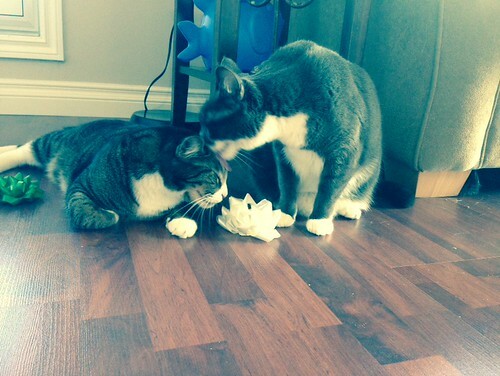 This was the closest I could get to a picture of the cats with bows on them. Likewise, the frogs were not keen to have a bow on them. But they wish you all a “Merry Christmas” nonetheless! In my old apartment, I had built in gas fireplace with a spot above the mantle that was originally meant to hold those old boxy cathode ray tube TVs, but which made a very good place for a frog tank. My new place doesn’t have the built in gas fireplace, so when I moved in, I was faced with the question of where to put the frogs. I needed a piece of furniture that was strong enough to hold the tank, that had room for the two electrical cords required (one for the filter and one for the heater) and, ideally, that looked nice too. 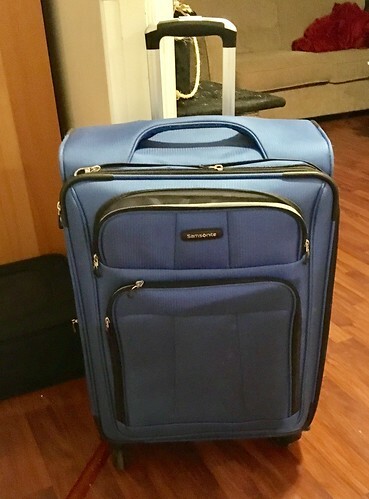 When I first moved in, I put them on top of a small bookcase that I had1, which seemed fairly sturdy, but I wasn’t 100% sure it would be able to sustain the weight over the long-term. One of my friends suggested that I should get a stone pillar – like the kind you might see in a garden, but I looked at a few places and couldn’t find one. 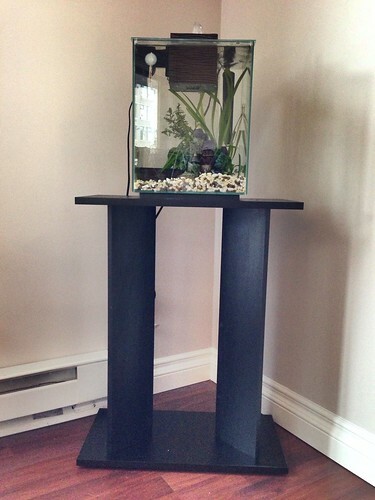 And then I got the brilliant idea that perhaps I should actually look a a built-for-purpose aquarium stand. 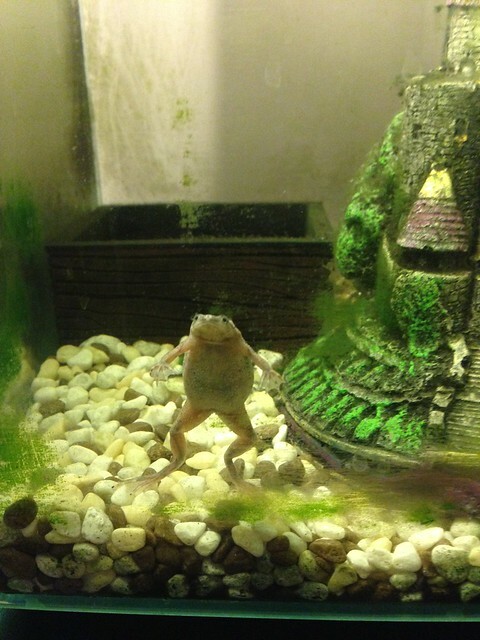 I looked around online and found a few things that would be serviceable, but I decided I should check out the store where I usually go for my frog needs, Aquariums West2. I needed some new filter pads for the frog tank anyway, so I headed downtown yesterday to the store to pick those up and check out my frog tank-supporting options. They had some tall black plinths which were very nice, but cost nearly $200 and of all the things that I want to spend $200 on, plinths are not high up on my list. But, as luck would have it, they had a couple of small aquarium stands that were end of the line, so they’d built them up and were selling them at a deep discount. Which meant that I got an aquarium stand for cheap AND I didn’t have to put it together3! And so I bought the stand and put it in a different corner of the living room than I’d had the tank in on the bookshelf – I’d put the bookshelf in was a corner between my two giant living room windows and so the tank was getting too much sunshine, causing the algae to grow like crazy. I’m hoping that having the tank not in direct sunlight will prevent that from occurring again! Today was a stat holiday in BC. Family Day to be specific. It’s only the second year we’ve had it and, I must say, it’s really nice to have a 3-day weekend in February. Especially because I had a 10:30 pm hockey game last night and it is sooo hard to get up in the morning after those late games. Actually, this weekend was pretty glorious in that I got to sleep in all three days! One of the things I hadn’t thought about when I joined the 12-week running study was that it meant I’d have to get up early every Sunday for 3 months to get to the group run! Now that the running study is over, my weekend running will be with my friend Alicia, training for the Hollywood Half, but at the moment we are doing those as Saturday afternoon runs ((As we get closer to the race, we’ll start doing more early morning runs, as the race starts at 6 am and we don’t want that to be a total shock to our bodies! ), so sleeping in on the weekends is the name of the game. Surprisingly, the kitties generally don’t wake me up to feed them – though Watson was meowing and meowing and meowing yesterday morning *after* I’d already gotten up (late) to feed them and then tried to go back to bed because did I mention how much I love to sleep? I never did figure out what he was meowing about, as they’d been fed, and had water and clean litter. What else could a kitty want? Usually, though they don’t wake me up, when they hear me get up they come running into the bedroom (if they aren’t there already) to tell me they want breakfast, but this morning when I got up, they didn’t come in at all – so I went out to the living room and they were sitting side-by-side on the couch! It was so adorable and I turned to grab my camera, but they both dove off the couch and came running after me, because breakfast. So yeah, I’m trying to remember if I actually had a point when I started writing this posting, but I don’t think I did. 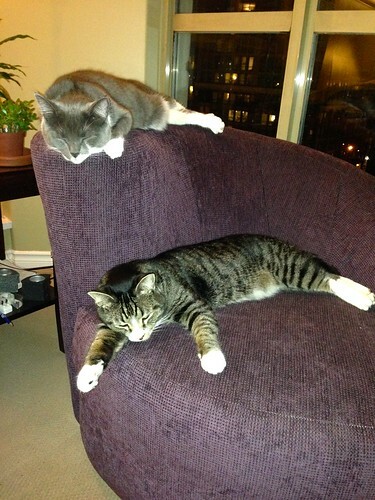 Instead, check out this photo of my kitties! And this video of my froggies! There comes a time in every woman’s life that she must become a crazy cat lady. For me, that time is now. You may recall that I recently did some cat sitting and decided that cats are the awesome and I want one. Well, you know what’s better than one? Two. Two is better than one. At least when it comes to cats. After returning from Christmas holidays, I started looking at cats on Petfinder, a site that amalgamates profiles of pets looking to be adopted from a variety of different organizations. 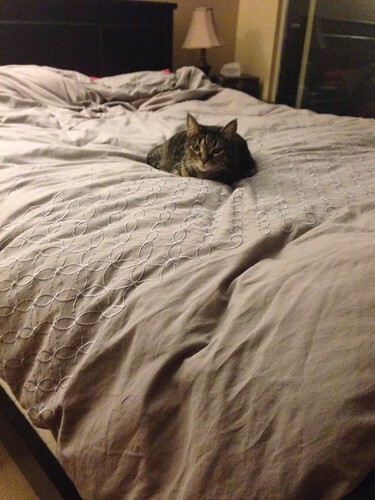 Looking at kitty profiles, by the way, is remarkably similar to online dating. You flip through the catalogue of potentials, eliminate the ones you don’t think are a good match (Too old. Too young. Not cute enough. Too needy. ), take note of the ones you like and then you arrange a first date! Simon is an explorer and a thinker. He is curious about most things from cupboards to closets to observing what is outside our windows. An incredibly handsome two year old, he walks around our home with command and grace, always looking for the best place to lay down and observe. He likes it best being on his feet, not being held. A great conversationalist, he is always meowing when he sees you are a little preoccupied or not petting him behind his ears. The younger brother of Blue, Simon is very independent but is never shy to cuddle with his sister. They love to play and race around. After some good down time and napping they will spring to action with bursts of energy. The two stay out of trouble, we never come home to a mess or suspicious behavior, we think it’s because they have too much fun with each other to bother with anything else. In a home of three, Simon is very good with people. He may be shy upon meeting, but once everyone has settled in he will make his introductions and find his favorite place to hang out. Sweet Lady Blue, or Blue as we commonly call her, is the beautiful older sister of Simon. She walks with poise, has a stunning gray/blue coat and a very feminine, pretty face. One of her favorite things is her cardboard box. A typical cardboard box we had left in the kitchen immediately became Blue’s best place to nap and relax. 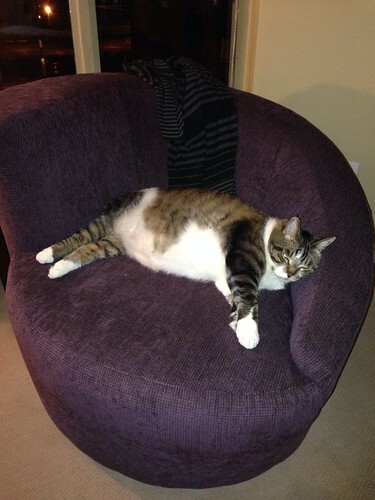 We couldn’t recycle it after seeing how much time she spends lounging in it. Being Simon’s older sister, she makes sure he always looks nice by spending some time cleaning his face after eating, usually retreating for a nap soon afterwards together. Although the elder, she never passes up playtime with her brother. Our household loves to read and we soon found out Blue does too. When not in her box she’ll enjoy cozying up to the pages you’re reading, peering her cute face up at yours, we cannot help but give her attention and well deserved belly rubs. Simon and Blue have beautiful personalities and telling faces. 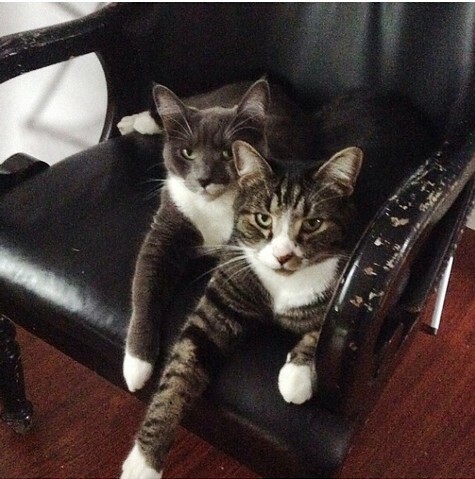 The pair are so well behaved, independent and loving we know they will be a dynamic addition to their forever home. After seeing their pictures and reading those descriptions, I just knew I had to meet them. So I put in an adoption application, had my phone interview, and then last night I got to go to their foster home and meet them. 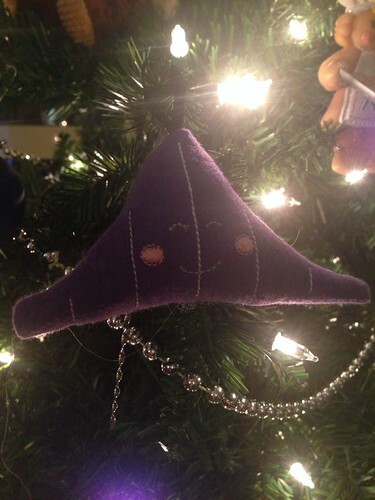 OMG, so freaking cute! Simon came to the door to meet me and right away was letting me pet him. Blue was a bit more reserved, preferring to stay on her perch on the sewing table and making me go to her, but she was very friendly right away when I approached her. And pretty soon the two of them were playing with toys and just generally being adorable. And since we hit it off, I decided I wanted them, so tonight I did the paperwork and now they are mine! I am arranging to go pick them up on Saturday! I’m 99% sure I’m going to change their names and I’m 97% settled on what their names will be, but I will save that bit of information until I pick them up and decide 100% for sure. So, since I’m going all crazy cat lady, you can expect a bunch of postings of photos of my new kitties once I get them. But don’t worry, I’m still also going to be a crazy frog lady. I’ve assured the froggies that I will protect them from becoming snacks for kitties and I’m sure there will be some frog photos to accompany the cat ones. Last night, after everyone else had gone to bed, I was watching Rick – I’m worried that he must be lonely all by himself in that tank – and he seemed pretty happy to see me. He was jumping around in the water to get my attention and such. And then he started humming! Humming is what male African dwarf frogs do to entice female frogs to mate. I think Rick likes me! 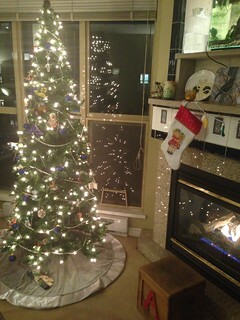 So, yes, I realize it’s not yet December, but since I’m going to visit my family at Christmas, I had to put my tree up early so I’d have time to enjoy it before I left. And for the first time in my life, I actually have a skirt for my Christmas tree, which I bought on my lunch hour today. I think it really makes the whole situation look more polished! Bring on the egg nog! For the next 11 days, I’m having some house guests. 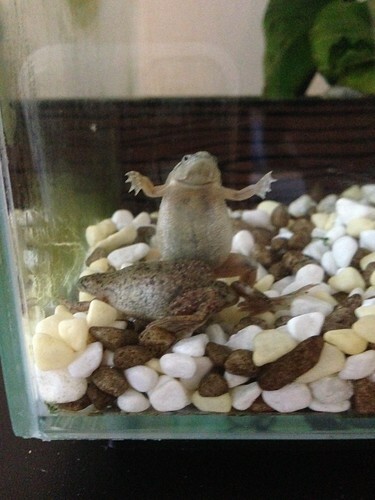 Happily, neither of my house guests appear to have taken any notice of my fraggle of frogs. I’ve secured the tank lid to keep out curious kitties, but neither kitty has shown any interest whatsoever in my little amphibian buddies. So that was a relief to have that clarified for me. 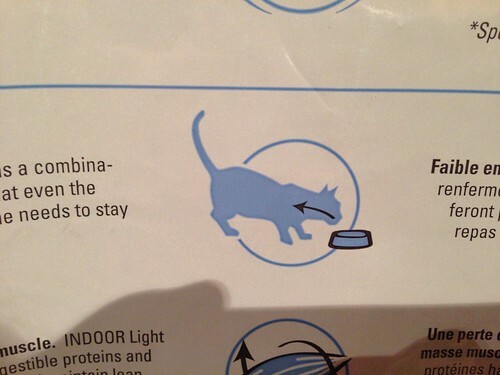 I’m hoping that as long as I insert food into the cats as shown in this helpful diagram, they won’t go looking for a frog-sized snack. The big one to the right of the stick-person-me is Timbit and the small one to the right of Timbit is Tyrion. The other two are Raspberry and Copernicus the Third. I can never tell those two apart, either in real or decal form. 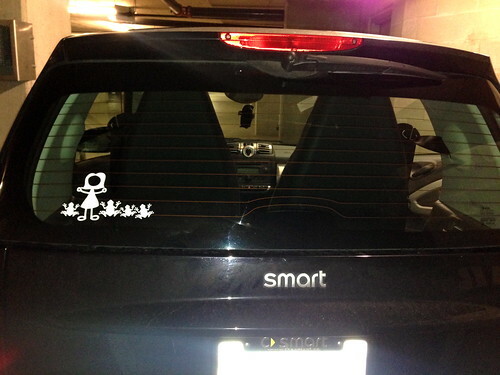 (And before you ask, yes, I am being facetious by having this on my car. 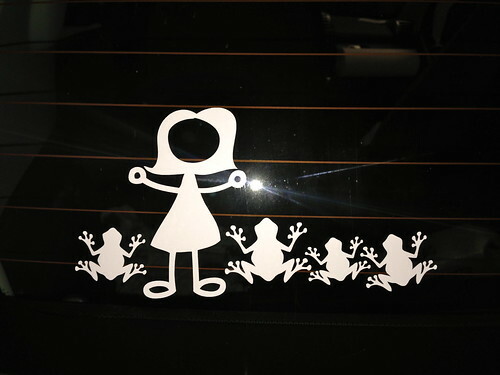 I had some sort of a conversation on Facebook1 where these car decals were mentioned and I joked about how I hadn’t seen one with a women and four frogs and my friend Michelle said, “I know someone who makes those things!” and then pretty quickly I had an image of this one in my email inbox and I just couldn’t resist! ).